JW Seagon’s quarterly magazine for our loyal client base. Welcome to the first edition of CQ in 2019 – I hope your year has got off to a great start. This quarter we’re talking health and wellbeing in the workplace. As the MD of a company employing over 40 people in more than 4 countries, I personally know the value of having your employees firing on all cylinders. And by giving them the right support, employee benefits and attention – it can make a big difference to your bottom line. We were delighted to see so many of you at our recent breakfast seminar. It was an eye-opening session for all those that attended as we outlined key learnings about the importance of dealing with mental health in the workplace, as well as some ideas on the necessary changes required to reduce stress in the workplace. 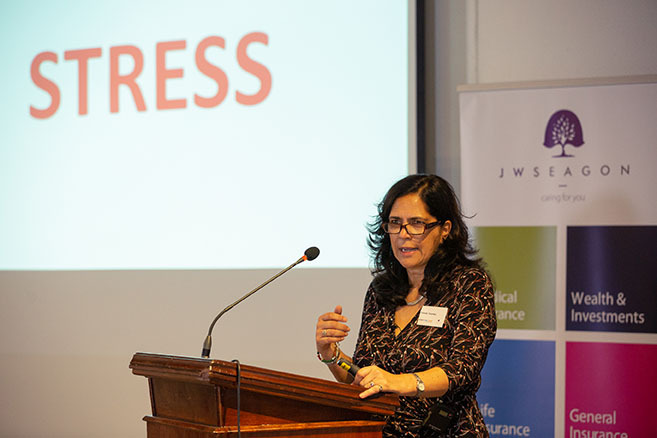 Dr Yolande Coombes our first speaker addressed the topic of stress in the workplace and the impact this has on organisations in terms of damaging their work culture but also the financial implications. She revealed to us some astounding stats that made HR managers and company directors perk up and pay attention to what they were potentially losing out on by not addressing this issue more closely. She also educated us on the science behind stress and the automatic ‘fight or flight’ reaction and the power of the ´chimpanzee´ brain, both of which are not particularly useful in the context of an office! Finally, she proposed some easy fixes and small changes we can make to our everyday lives in order to help minimize the impact of stress. Very simply, we all need to spend less time on our phones! It was great to see all delegates enjoying the delicious breakfast on offer in the relaxing environment of the Southern Sun Mayfair! Any general Google search will quickly reveal that stress within the workplace is rife and worse still, it’s on the rise. And when it comes to the actual statistics, it doesn’t make great reading. The following highlights were taken from The American Institute of Stress. An Employee Assistance Programme (EAP) assists employees with personal problems and/or work-related problems that may impact their job performance, physical, mental and emotional well-being. 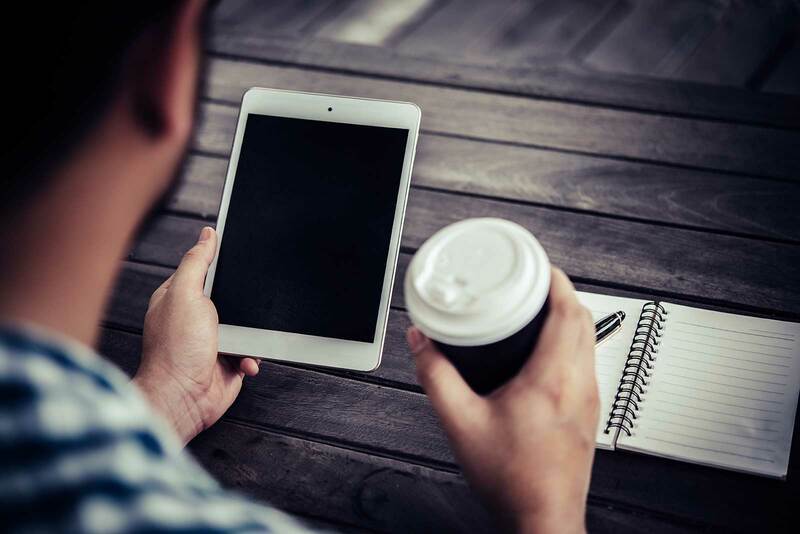 Online services – the EAP website offers unlimited access to online counselling as well as information on the programme and on a variety of topics. Culturally adapted to suit employees’ needs and origins, it is currently available in 15 languages. Critical incident management – In the event of a major incident such as a catastrophic accident, employee death(s), natural disaster or violent attack, rapid and efficient telephonic and/or on-site support is provided. Reap the benefits – EAPs have demonstrated the benefit of prevention over cure and a capacity to reduce absenteeism, medical claims costs and on-the-job accidents. They can also increase organisational loyalty, as it shows your employees how much you care for them, positioning your organisation as the ‘employer of choice’. 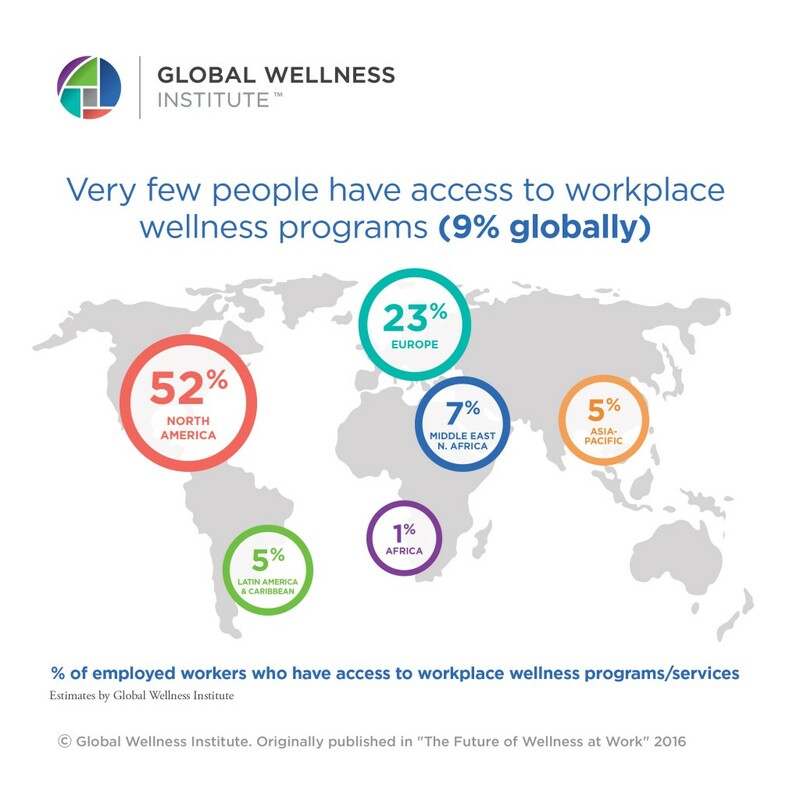 When it comes to employers providing workplace wellness programmes (such as an EAP), it won’t come as a surprise to see the USA leading the way in terms of numbers. What is surprising, however, is that Africa is lagging a long way behind the rest of the world. The following infographic was included in Yolande Coombes’ presentation and shows very clearly that Africa has been slow on the take-up of proactive health and wellbeing solutions in the workplace. In short, more needs to be done to raise awareness and as Insurance Brokers based in Kenya, it’s our job to show employers that employee wellbeing is a cost that they can’t afford to ignore anymore. We can’t talk about employee welfare and benefits packages without mentioning our new international private medical insurance product – JWS Worldwide Health Plan. Backed by Hollard Cigna Health, the plan gives prompt access to medical treatment at a time and place that suits the patient. The plan has a range of flexible options and importantly, can be purchased as an individual or company. With regards to health and wellbeing support, JWS Worldwide Health Plan doesn’t disappoint. The plan includes online health assessments, a Wellbeing app, chronic condition management and, for companies, an international employee assistance programme to help staff members lead a healthy, happy and well-balanced life.